A common problem that hinders people from making their desired changes is spending too much time in their heads. Let’s face it, we can talk ourselves out of almost anything if we want to! Spending too much time in your head can result in you playing all sorts of mind games with yourself leaving you wishing you had more self-discipline, beating yourself up for your lack of willpower and comparing yourself to others who seem to ooze self control. Do you really think that Olympic track athletes look forward to every single training session? Do you think there are people who never in their life have thought: ‘I’m too tired’, ‘ I won’t have time’ and so on. 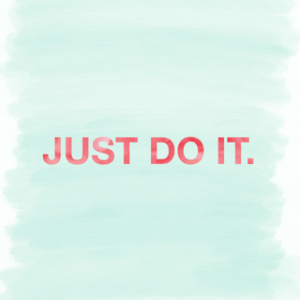 Nike really hit the nail on the head with their motivational strapline JUST DO IT. Simple, straightforward, get out of your head advice. Period. So next time you try to talk yourself out of what you want to do, remember to JUST DO IT.